You know when you sense there is more you want out of life, and yet you just aren't sure how to get it? 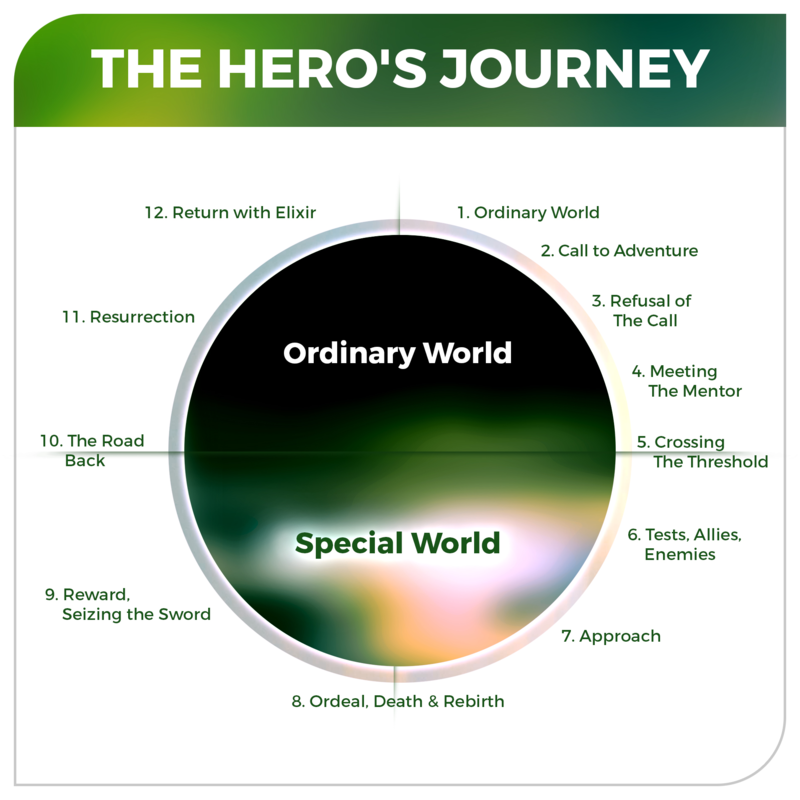 The Hero's Journey Guide solves that problem by showing you how to design your life, achieve your goals, and make your dreams come true via eye-opening journaling exercises, positive psychology methods, and proven goal-setting strategies. In 12 weeks or less you could be well on your way to knocking off items from your bucket list that have sat there too long; because by focusing on this just 1 hour per day the course gives you a solid foundation to operate from so you get more of what you want in life. Using The Hero's Journey as a framework for lifestyle design works because it's a metaphor for personal transformation used in the stories of all cultures since the beginning of civilization. In this case, you get to be the hero and create your own great story. It's effective to plan your future in this way because The Hero's Journey template helps you foresee the possibilities, pitfalls, and processes that go into creating the ideal vision for your life. By organizing proven goal setting strategies and Socratic inquiry according to the stages of The Hero's Journey, the work you do sinks into the subconscious mind, which will help you get what you want. Remember It. Do It. Live It. When you follow this format you're more likely to remember the answers you come up with and carry out the goals you set because you take action within the context of a pattern & cycle that's hardwired into all humans. When you foresee the changes you want unfolding in this way, you'll be prepared to do what's needed to realize your dreams because you'll be able to charge the process with positive emotion. 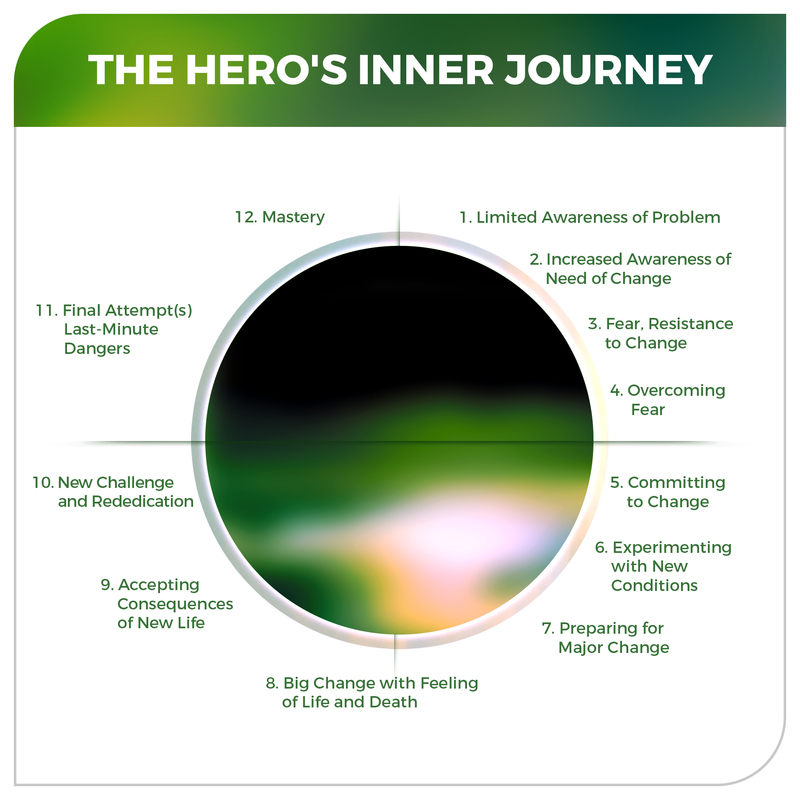 Filling in the details of the process according to The Hero's Journey template, helps you see & feel the possibilites and actually comply with your plans, goals, and dreams for the best version of yourself in future. The exercises in this guide show you how to turn the rest of your life into the cool story you want it to be. Living through all the cycles of The Hero's Journey and using the template as a framework for goal setting exercises gives you a clear picture of what you want in life — and how to get it. You'll be able to look back on your exercises in light of The Hero's Journey framework, and gauge where you are along the way. Using this template makes goal setting & realization emotional & exciting so you can't help but follow through. What Does Your Hero's Journey Look Like? I'm a firm believer in the power of inquiry. When we ask ourselves the right questions we get better answers, and can plot the correct course of action in order to realize our goals. A series of profound questions & journaling exercises related to the cycles of The Hero's Journey. A sense of accomplishment. Writing out answers gives you clarity & focus as you set goals that move you toward the life you most want to live. The ability to predict potential obstacles, and learn how to deal with them. The right questions we all need to ask ourselves in order to make lasting, positive change. Mindfulness exercises so you keep your head right as you transition to the best version of yourself. A structure you can always refer back to whenever you want to start a new life project. Clear, easy to follow journaling exercises you can complete in less than 1 hour/day. When you answer all the questions, and complete the exercises as if you've already been from beginning to end in your journey of personal growth & transformation...you can envision the life you want, create a solid plan for its manifestation, and make it happen just like you write it. After you finish this program, you'll have an exciting course of action to implement — with clear steps toward its realization. A few short weeks from now, you'll be well on the way to making your life into an adventure. How might you get what you want? How to stop procrastinating and make yourself do important stuff you don't enjoy doing. How would you like to finally have a new experience — in which you go from just thinking "It would be so great if I could..." — to actually doing all the things you say you want to do? I imagine you've read many of the best business books, gone through goal setting courses, and listened to audio & watched video programs on personal development. And yet, you're still looking for an edge, something that will take you to the next level. If you're anything like me, you just want to get to the essence of the teaching. You only want the exercises — without — personal anecdotes, boring examples of people you don't know, stories of American business titans, and lame cheerleading. I respect your intelligence, so there are no videos of me telling you hard-luck tales of turning failure into success. That's why I compiled the best exercises I've learned from positive psychology, goal setting & personal development courses — and eliminated the fluff — so you don't waste time, can get straight to the point, take action, and get results fast. When I arranged all the best exercises according to The Hero's Journey, and re-did them...they finally took hold for me, and I reached goals that had eluded me for a long time. My intention in doing this is so that you too can have a framework for realizing your dreams — a structure that helps you persevere and see your plans through to the end, and a repeatable process you can do again & again throughout life as you take on new challenges. You have a strong desire to realize a big goal, and need extra clarity to get there. You just want to dive into the journaling exercises, without watching hours of video and listening to someone "teach" you. You know you have the answers within you, and are open to a new way to get them out of you. You want a novel way of thinking that focuses your mind & creates a habit of success. You're eager to start a new business, change jobs, move to another country, stay home & find fulfillment, or discover your purpose in retired life. You hate journaling, and writing out answers to life's most important questions. You don't have a strong desire to intentionally design your life & live it on your own terms. You won't do the exercises in order & follow through on your plans. You need long, drawn-out explanations & videos. You need a motivational "internet famous" person to get you pumped up, instead of just completing the exercises to arrive at your own best solutions. Just imagine how you'll feel when you finally take all the dreams swimming around in your head, get them on paper, and start making them reality. Think of how liberated & accomplished you’ll feel when you finally start knocking items off your bucket list & realizing long-held dreams. Even if you’ve tried to achieve big goals in the past & just couldn’t cross the finish line — by using The Hero's Journey Guide — you’ll have developed in less than 3 months an exciting, actionable plan to realize your dreams...and be able to repeat the process successfully for every item on your bucket list! There is no risk for you to try using The Hero's Journey Guide to design your ideal life, do things you've never done before (but always wanted), and realize long-desired dreams. I invite you to go through the course for 30 days. If you don't believe you can finally get what you want in life after completing the exercises...I'll refund 100% of your money with no hassle. Isn't it time you design your life the way you really want it & start living on your own terms? I help expats reinvent themselves & live a fulfilling life in a new country. I've lived an unusual life because I decided at a young age to do whatever it takes to travel around, live in various beautiful places, and pursue my dreams. Along the way, I picked up excellent goal setting strategies and successful means of navigating the transitions and coping with the difficulties in adjusting to big life changes every few years. Now I want to share as a virtual coach what I've learned about personal development, perseverance, and living intentionally according to one's own values & goals.